As the twenty first century pushes onward, the need to preserve the web gets greater and greater. Web archivists have compared the loss of the resources of the internet to the loss of the Library of Alexandria, without web archives, there would be a tragic loss of a huge gap of our knowledge of this current period of time (Kalev H. Leetaru). Resources like the Internet Archive and the International Internet Preservation Consortium have taken the lead in attempting to preserve the ‘Net, but smaller institutions, like NYU’s own Tamiment Library, have been bolstering their own collections with web archives. 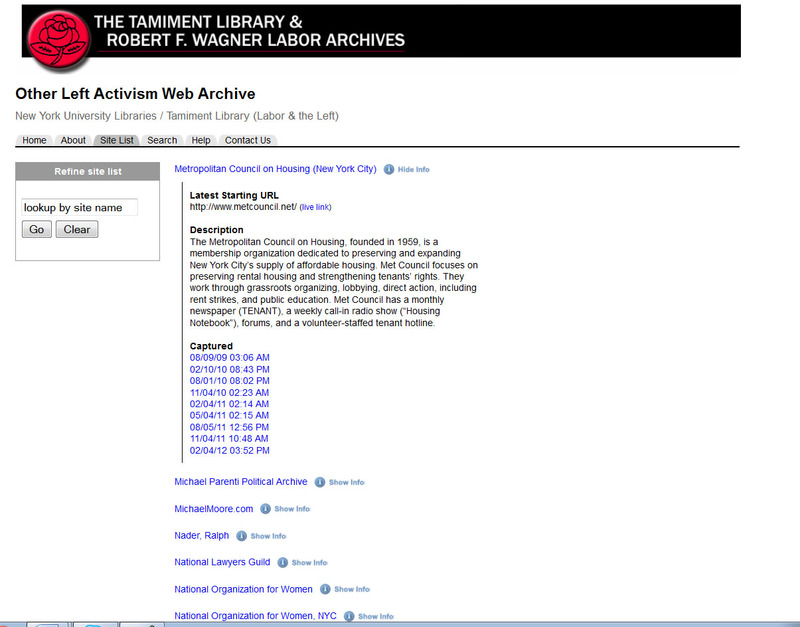 For the past year plus, I have been working on Tamiment’s web archiving collections. Making something public on internet doesn’t necessarily make it accessible, so I’m offering a how-to so researchers can use resources that are otherwise not found on the live web. Let’s get started, shall we? First, access Tamiment Library’s homepage, which is found here. 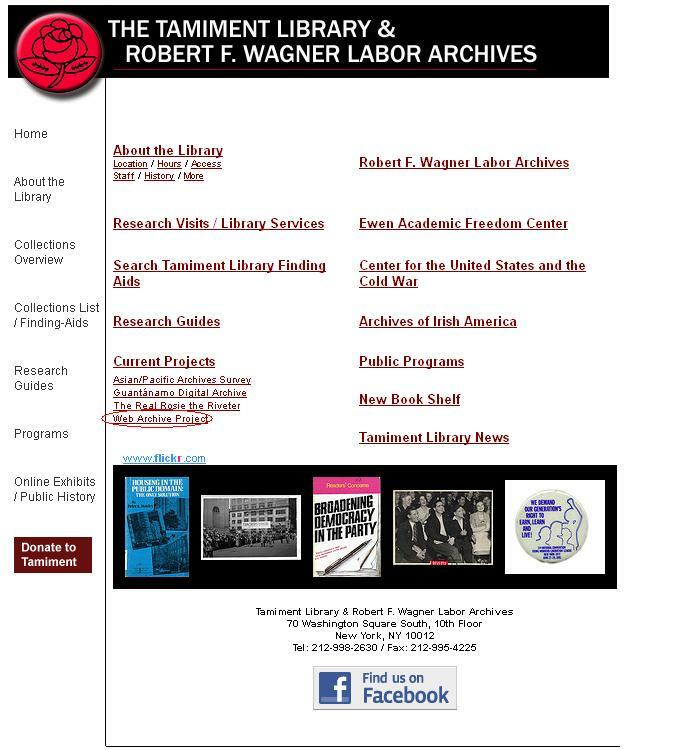 Then click on the tiny little button which says “Web Archive Project.” (You can also access the web archives through the finding aids portal). The next page takes you to a link to the entire list of web collections that Tamiment has gathered (or captured, as we say in web archivist-speak). There are two ways to access the web archives. Either by clicking “The Tamiment Library Web Archive” or by scrolling down and clicking on each collection directly (this page, unfortunately, has not been updated with each current live web collection). We are going to click the former. Here, you can browse the collection’s websites. 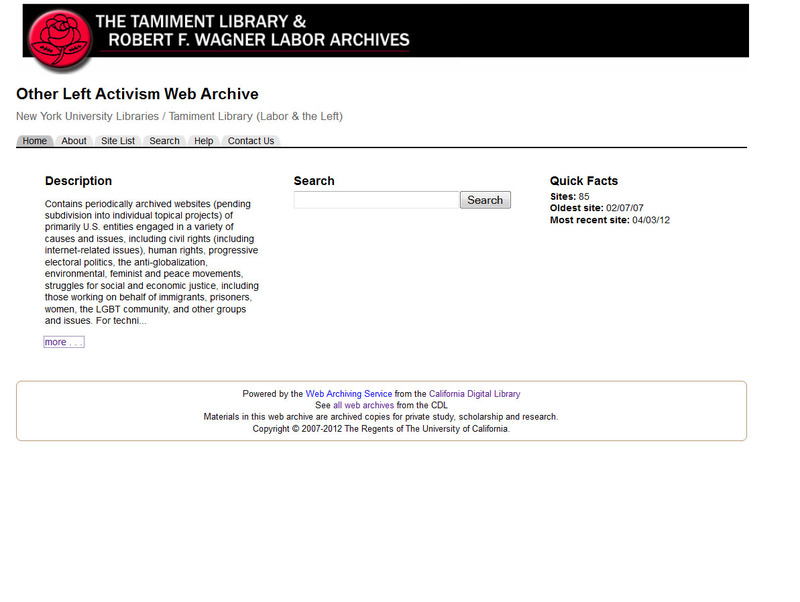 Other Left Activism gives a good picture into the Tamiment Library’s collecting policy, the types of websites in this collection range from housing rights to arts and the cultural left to human rights groups to feminist groups to unions. After browsing, hit page three and at the top of the page will be the website we will be examining, the Metropolitan Council on Housing. Each website comes with a short description, in addition to a list captures and the live link. Clicking directly on the name of the website will take you directly to the most recent capture. Captures become “live” 6 months after it is first captured, due to privacy reasons. We are going to click on the earliest capture from 2009. Although these are just screenshots, it is immediately apparent that the website has changed drastically in the last three years. The format has completely changed, as a matter of fact, by looking at the old crawls, the formatting has changed within the last 6 months. Without the web archives, not only would be lose the content, but would not be able to track the change of the website, especially when it often provides information to the public that is not often printed. Unfortunately, the web archiving service is beset with issues. Captures are not always perfect. Often, depending how they are embedded, youTube videos, RSS feeds, and other embedded information does not capture, and it appears broken on the page, which you can see at the Paper Tiger archived website. Sometimes it just renders as text or does not captures at all, likely because the website blocks robots, which includes the software we use to crawl the websites, like WILPF. However, I believe the pros outweigh the cons. The web archive provides ephemeral, contemporary material on organizations that would otherwise be lost. Even in an incomplete form, it is still more valuable than having a void of information on labor and left movements of the twenty-first century. When the vast majority of information that used to be analog is now digital, it is important to capture this information before it is too late and lost to future researchers. 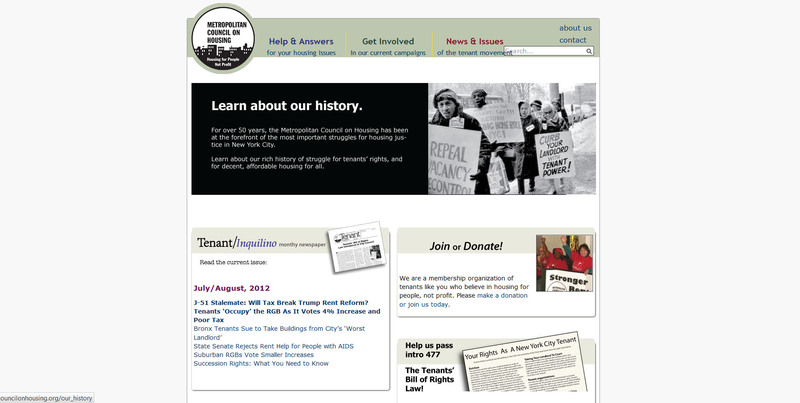 Feel free to browse our web archives, suggest new websites, and ask questions. I plan on using some of these archived websites for my digital archive, I hope you consider using archived websites as sources for your own research.